Pie Rock up on the ridgeline, a little preview of whats to come! The Phoenix air was cool and brisk as I walked out the front door to meet Sam, Matt, and Mark to start the days trek. We threw our gear and ourselves into Sam’s 4Runner, ready to head towards the Supes in search for another adventure. 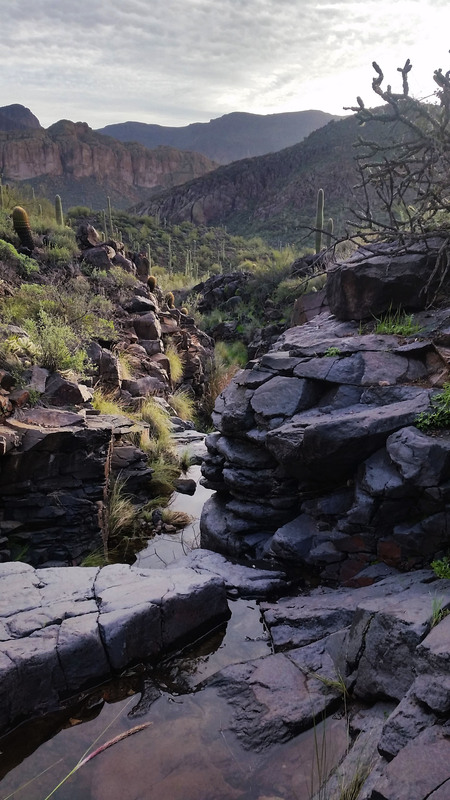 It had been raining the last few weekends, which cut the option of rock climbing out, so instead we decided to do a nice hike/scramble to make up for it. 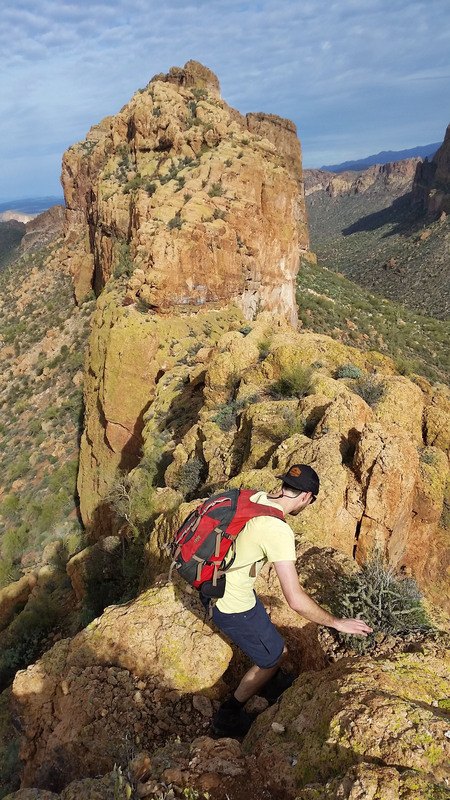 The target for the day was Battleship Mountain in the Superstition Mountains. 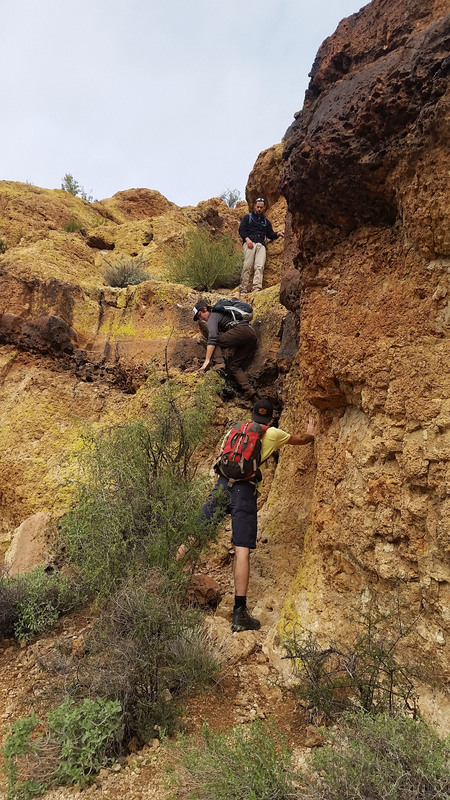 This route had been on my ‘to do’ list for quite some time, due to its “scramble” and position as a prominent feature of the Superstitions wilderness. Trailhead! Time to get moving! 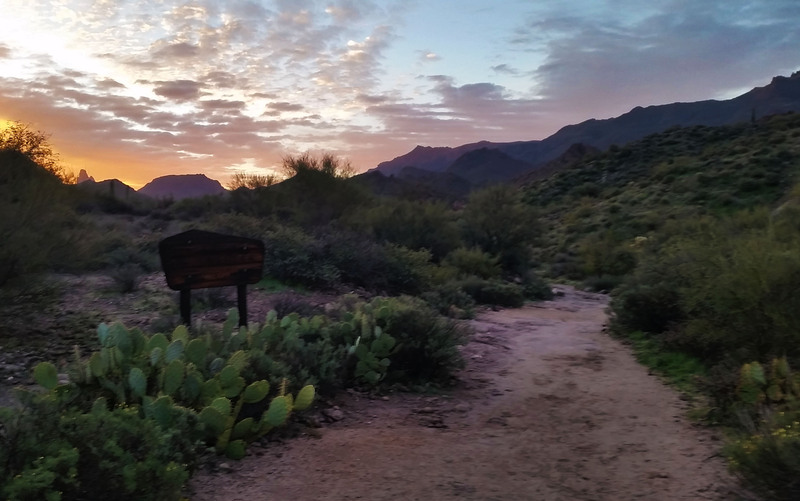 We headed to the trail-head, coffee in hands, chatting about the previous treks and what brought us all to Phoenix. The drive flew by and before we knew it, the car doors swung open, hoodies were zipped up, we were ready to put feet to trail. The sun was rising as we set out, but not quite over the mountains to our east yet. The golden haze filled the valley as we trekked forward. With all the rain, the Supes were alive with lush green color. 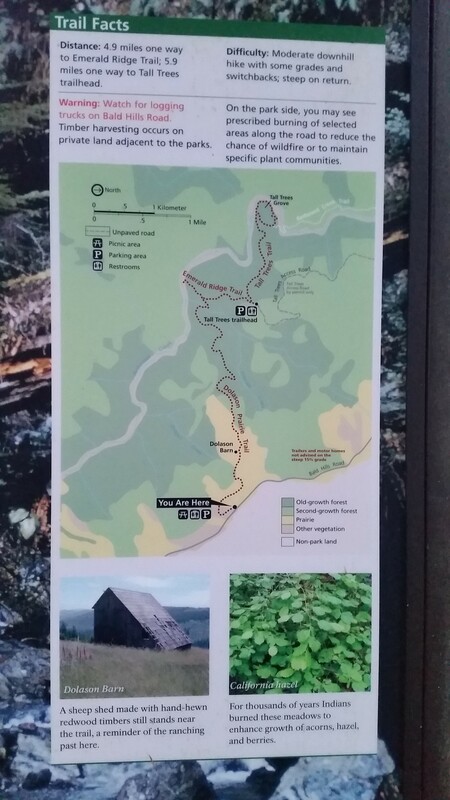 We trekked the relatively easy rolling trail 236 through the Garden Valley. 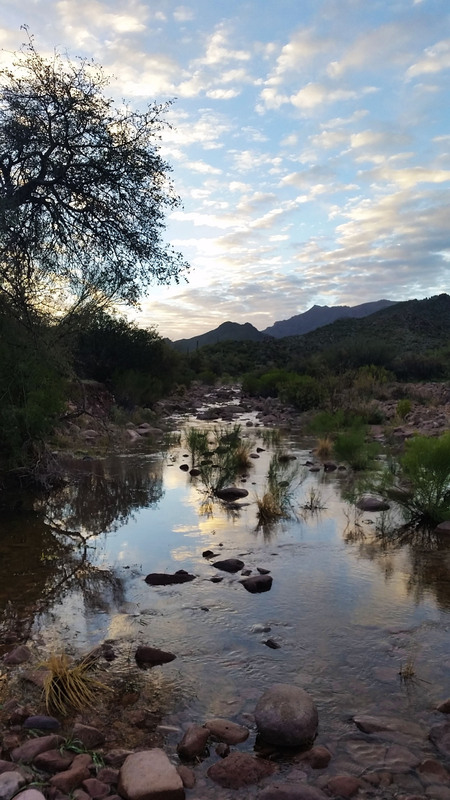 Golden sun, great views of the snow covered Tonto Mountains to the north, and the live breathing desert around us. What more could you want?! Agua in the desert, that’s right! The trail was muddy in places, but as we hiked on the padded trail went from smooth to baby ankle buster boulders. We continued downhill until finally reaching the junction with trail 103 which wasn’t a trail at all, it was a raging creek! Undoubtedly, this was a byproduct of the weeks’ worth of rain. Green grass on the creek edge laid flat as a pancake as a tribute to the powerful flows rolling through just days before. We followed the trail to the southeast. Hopping from boulder to boulder, we attempted to stay dry. The temps were still cold, so I was like a cat on the edge of a pool, using all my will to stay dry. Mark and I crossed the river early where Sam and Matt decided to stay on the west side for some time. Almost to the other side I heard a large plop behind me. I turn to find Mark with his leg in a cascading waterfall up to his knee. A large rock had shifted (and not in his favor) plunging him into the creek. “Whelp there went that!” He trudged the rest of the creek without a care of being wet anymore. We made it to the other side and continued to find our way up the bank. Sam and Matt did the same, hopping from rock to rock until we all finally met back up further upstream. There was a good half mile of this silliness before we finally reached our turnoff: the end of the spine of Battleship Mountain. Happy to see a cairn or two headed uphill, and we got after it. We split from the creek and started to gain the ridgeline. I was tired of boulder hopping, and looked forward to the view of the surrounding area so the climb was much welcomed. We got made our way up the rock, and soon with hearts pumping and heavy breaths we gained the spine. We followed the cairns towards the head of the ridge-line and the summit. 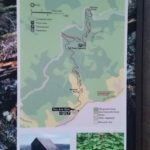 We would walk the ridge in some places, then get kicked off to the west in a small goat trail that bypassed a cliffed out ridge walk. We pressed on to the first of three small climbs. After a short deliberation, we gained the face quickly and kept trekking towards the peak. The views were fantastic! The Supes were so green and alive. From the ridge of Battleship, you could see for miles, including the water that was everywhere. 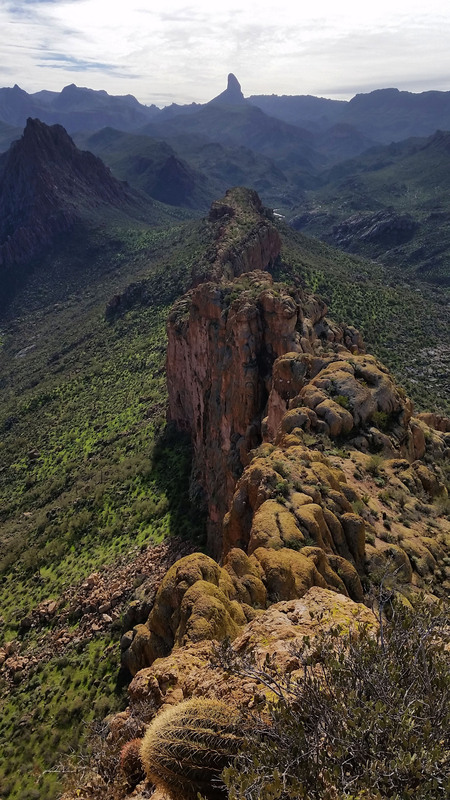 Canyon Lake, Weavers Needle, Flatiron, the Superstitions in all their glory! We paused looking at all the different formations surrounding us. The sights inspired fascination as to how they were formed and changed over time. Everyone was in good spirits and even some of the exposed scrambles didn’t seem to faze anyone in the group. Perhaps we were all too busy chatting and taking in the sights to notice. After some good trail finding and a few scrambles, we found ourselves standing at the peak, simultaneously touching the highest rock with grins on our faces. We signed the registry, had a snack, and chilled for a while just taking it all in. It was so nice to be out there, amongst the rocks with some good dudes on a beautiful Saturday. We turned back towards the trail-head and marched back the way we came. This time we had a little less regard for the cold of the creek and a few of us trudged right through. Mark and I couldn’t resist the 40 degree temptation at a neck deep pool on the trek back, so decided to get our Polar Plunge on. It’s definitely one way to wake up! Afterwards, we trekked our soggy selves back to the trail-head. Dried by arrival, we jumped in Sam’s 4Runner and headed back to Phoenix with another good story to tell in our pockets! Oh look there is Weavers! Looking back towards the towering beasts! The turnoff to the ridge is in sight! The water must have been rushing through here! Alarm blasting, the sun was just beginning to rise and I was shivering in my sleeping bag. I put on my sweatpants and tried to get warm. 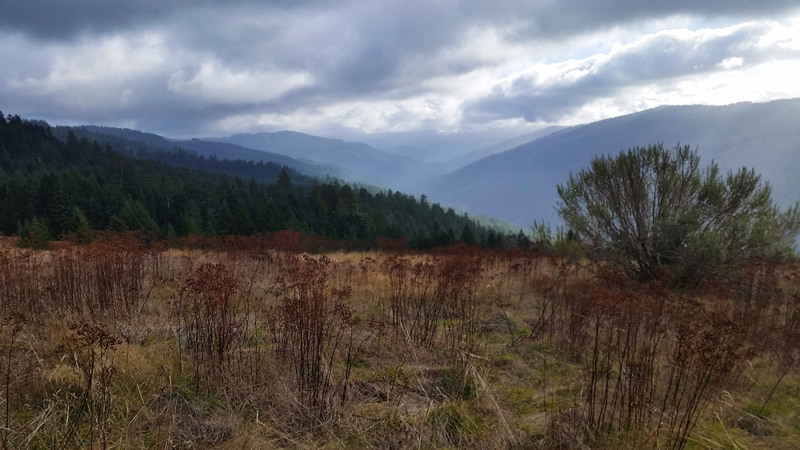 I was parked up on Bald Hills Road, a ridgeline overlooking the Redwood National Park. 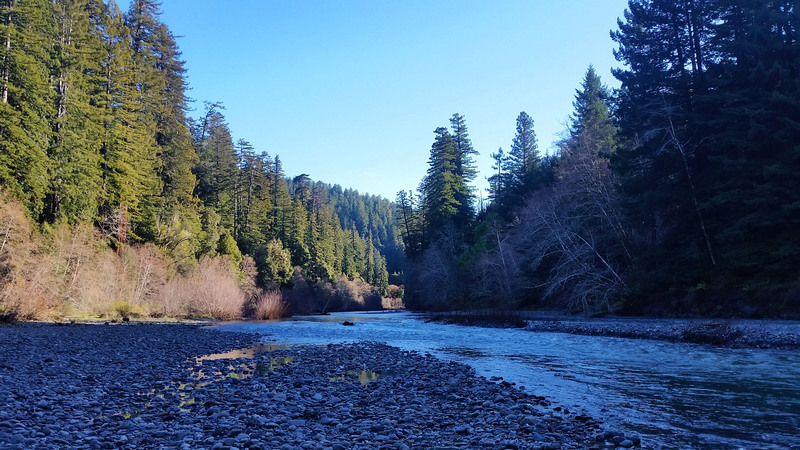 Down in the bottom of the valley below, far from my eyes or ears, the Redwood Creek raged, giving much needed nourishment to the tallest trees in the world. The sun rose over the valley which was soaked in a fog that sat like a blanket over the riverbed. It was an incredible sight to see. Despite the cold, I grabbed my things and started moving. I suited up with the normal cold weather gear…wool socks, pants, boots, and a wool long sleeve shirt. After layering up and kicking my stove on to cook a little oatmeal and coffee, I finally started to thaw. I had never been to this part of CA before, but shooting from the hip with what limited information I had and a little luck I found one of the best hikes in the entire park! I finished packing and, with the van warm, headed down the road a few miles from where I camped to the actual trailhead. The air was brisk. 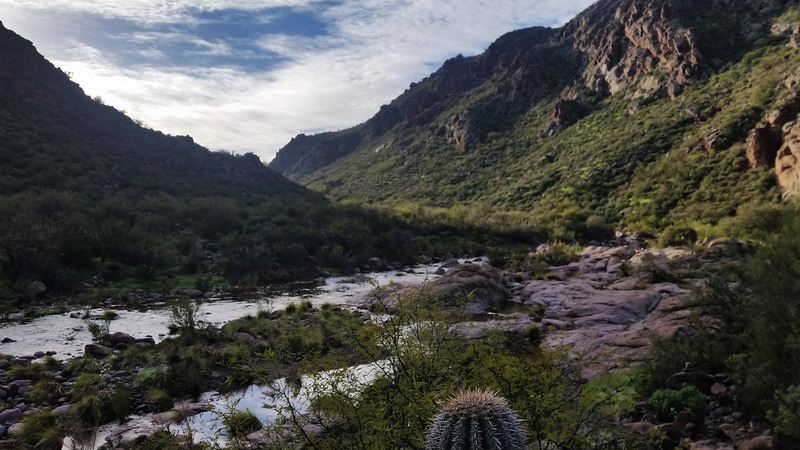 I strapped up and took a few shots of the sunrise and the valley below, still in awe as I stepped foot onto the trail. An open prairie led me to a small thicket of trees. I noshed on my Cliff bar as I trekked, amazed how green everything was. High on the ridge there weren’t any redwoods yet, only a few pines and firs. I dove down through the thicket of trees before getting spit back onto the prairie and eventually onto a forest road. 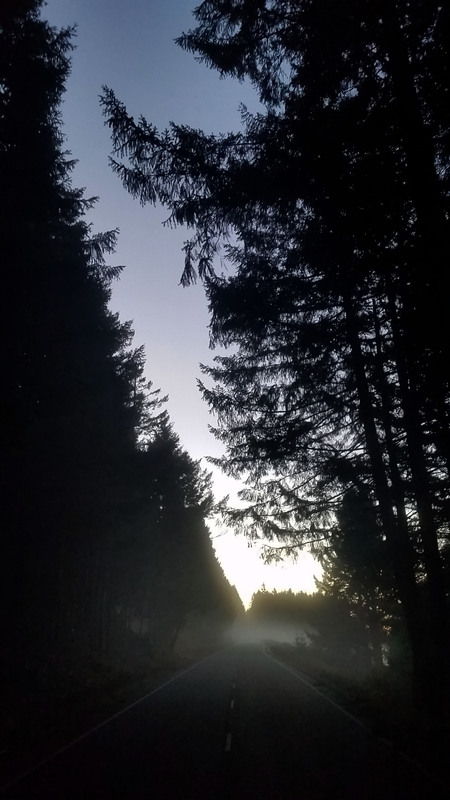 I followed the forest road for a short jaunt before once again being tossed downward into another thicket of trees towards the bottom of the valley. Gorgeous view after gorgeous view rolled by and I hadn’t even reached a mile in. The trees themselves had their own beauty. 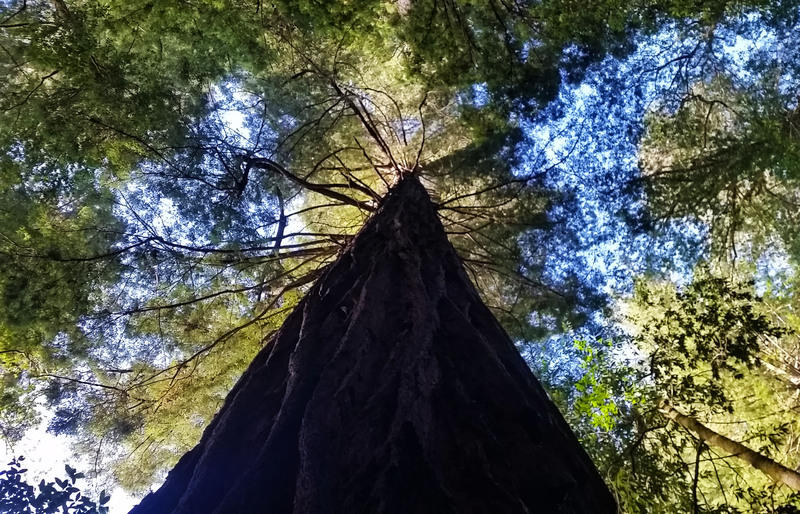 The canopy was so thick I couldn’t see through in some areas, and only small beams of light would snake through to make it through to the forest floor… it was magnificent. 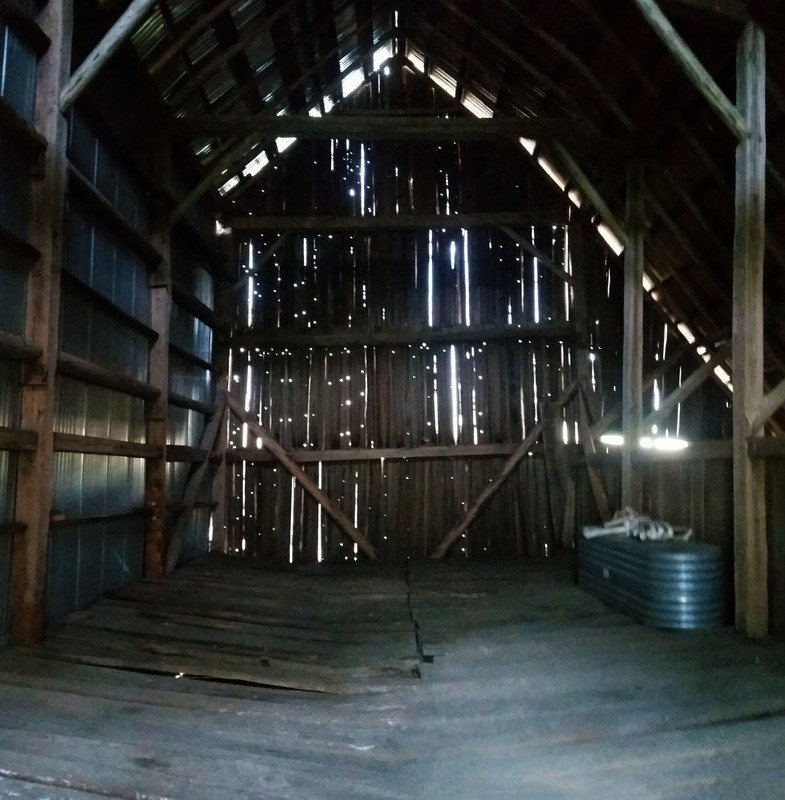 At the end of the next thicket I emerged to an open field faced with a 100 year old barn. 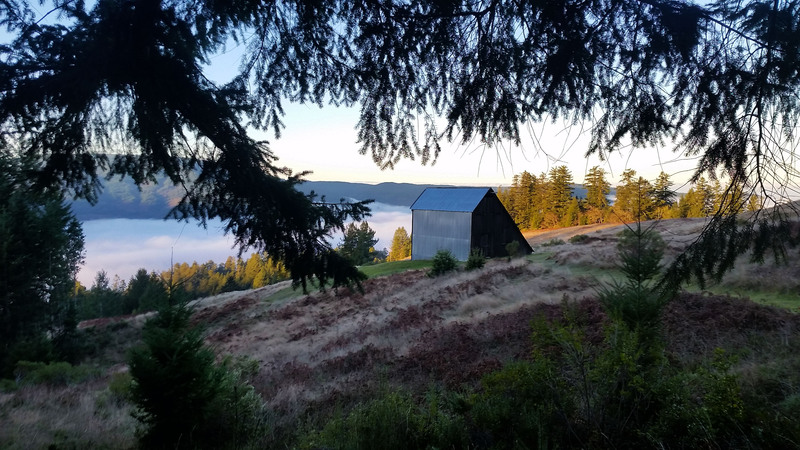 It was called the Dolason barn, built in 1914 on the Sherman Lyons-Ranch where sheep were herded to feed on the surrounding hayfield meadows. After all the years of battling the elements, it still stood strong as an ox. I paused to take it in with the sun rising over the foggy valley below. The trail once again entered the woods, and dark and deep it was. The high canopies blocked out all sunlight, with only a faint glow coming through to guide me down the trail. 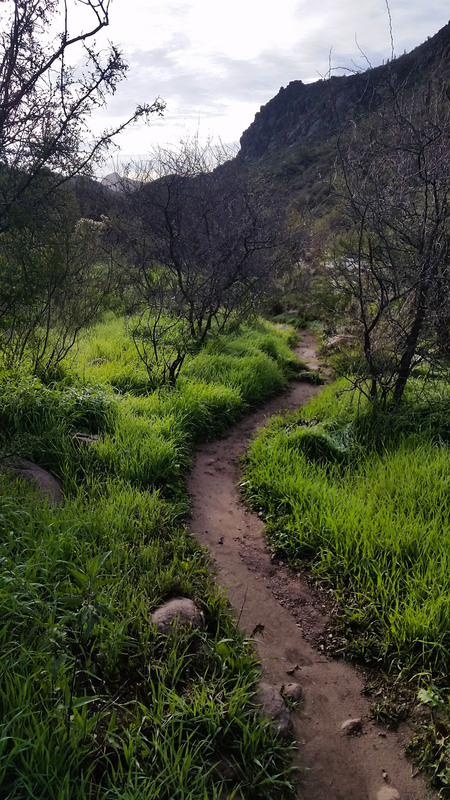 I pushed along the vacant trail…it was just me and the woods, the ferns, and the dew. 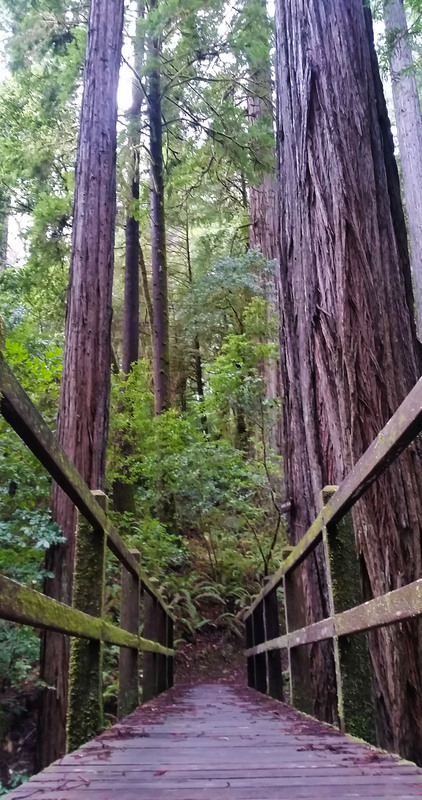 The tall redwoods finally came into sight, littered amongst the others, and I was really into the tall beasts. 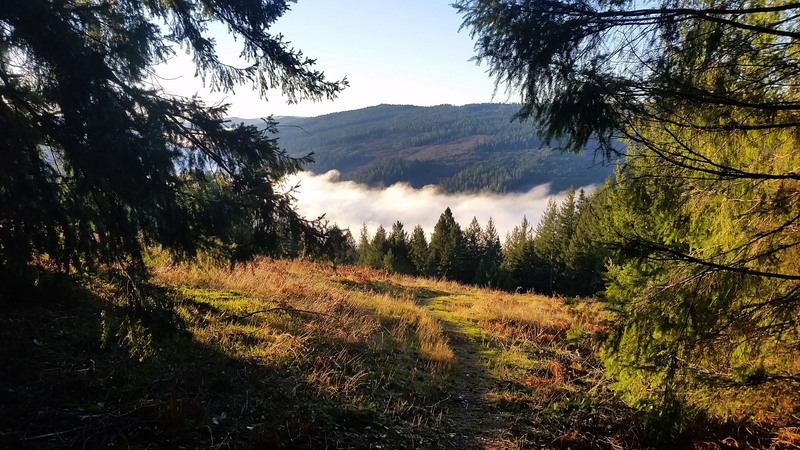 The woods were eerily quiet as I hiked further down, and I realized after some time that I was down in the fog I had admired that morning. I pressed on until I came across a bridge not far from the Tall Trees trailhead which would lead me to the river. 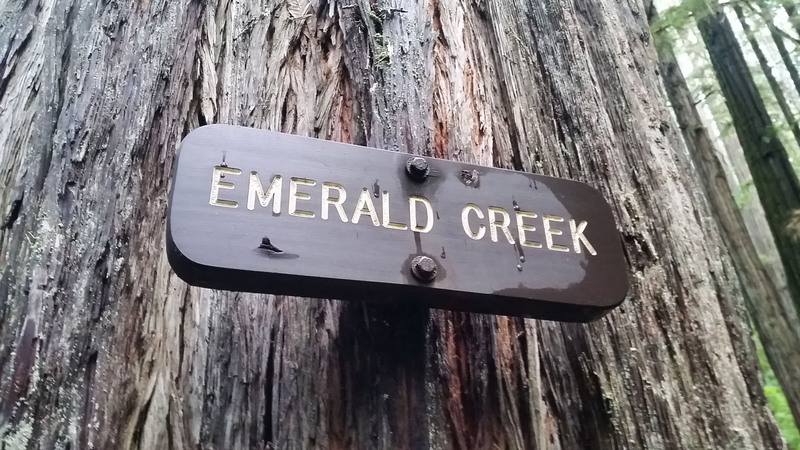 The sign read “Emerald Creek”, and immediately the song “10,000 Emerald Pools” popped into my head. Why not, it accompanied me the rest of the way to the Tall Trees trail head. There was only one car in the parking lot and an older fella with a handlebar mustache was sitting in the front seat getting his things together. I waved and headed down the trail. Although the trail was only one canyon over from Emerald Creek, it seemed much wetter. Everything had dew on it, which only amplified how lush and green it all looked. 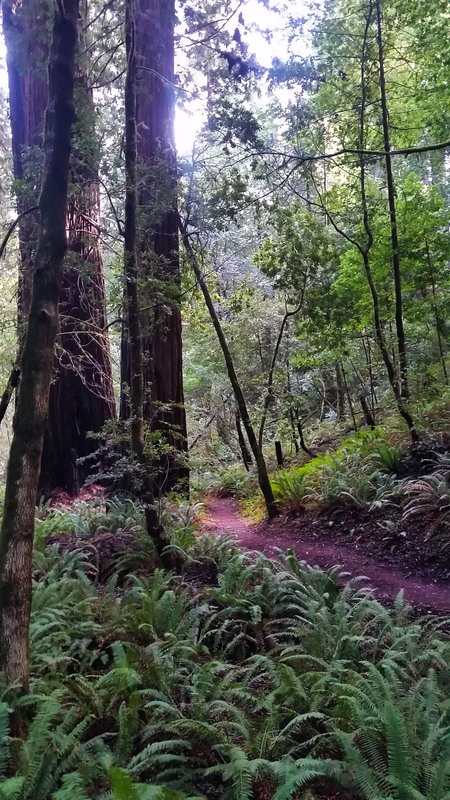 Small creeks trickled across the trail, moss clung to everything from rocks to trees, and ferns covered the forest floor…it was truly a different kind of paradise. lush, green, and covered in ferns! 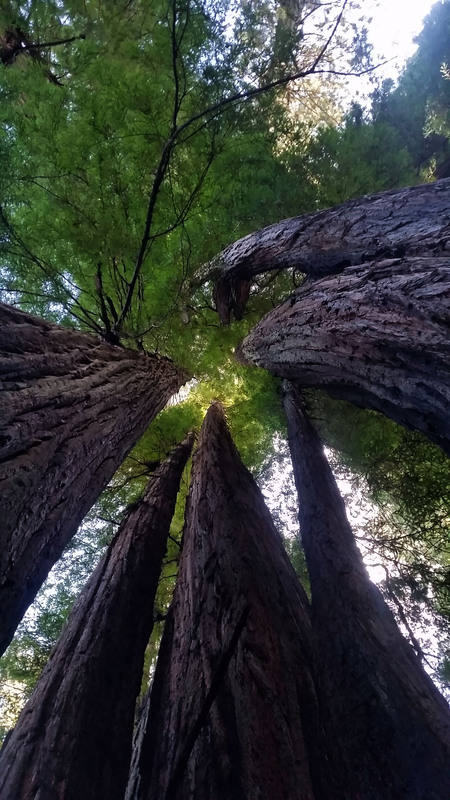 The Redwoods sometimes in groups sharing 1 base, but having many trunks, I am standing in the middle of one of these looking up! 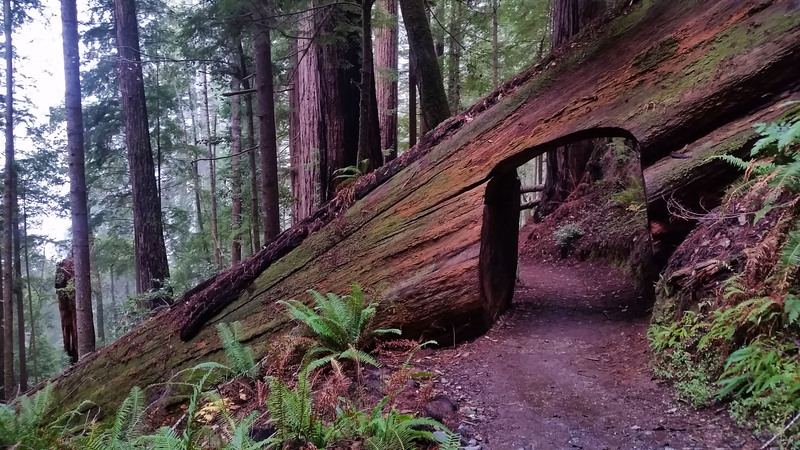 About half a mile in a huge tree lay across the trail, but luckily a nice symmetric hole had been cut directly through the middle for hikers to pass. I took time to admire it all and continued to hike on. Finally I reached the loop at the bottom of the bank that circled the tallest trees in the world. This was The Grove of the Giants, I was excited! I had expected to see signs at the bases of the trees with their names and heights but there was nothing. 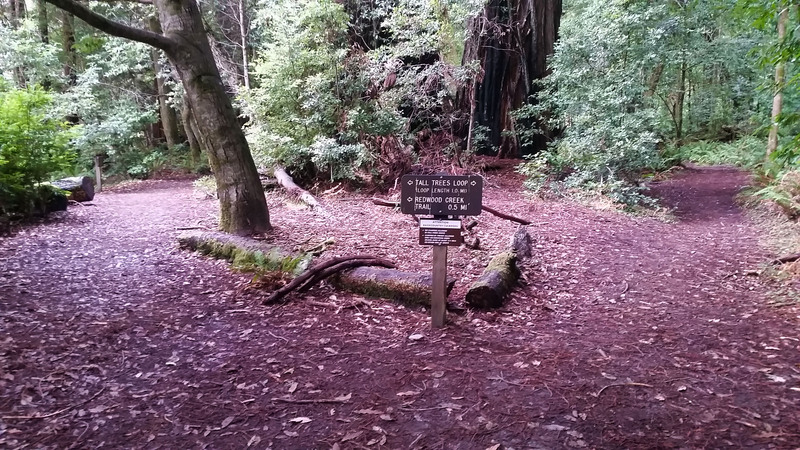 Only the one sign in front of “The Tall Tree” (Howard Libby Tree), which was the tallest tree in the world until overgrown by Hyperion (current tallest tree in the world at 380.3 ft) in 1988. I took a moment to walk around and appreciate the massive tree. Far up into the sky it reached, so high I couldn’t see the very top where it was 350+ feet, but I could see the branches at the top being bathed in the sunlight. It was incredible! I kept trekking along and finished the loop. 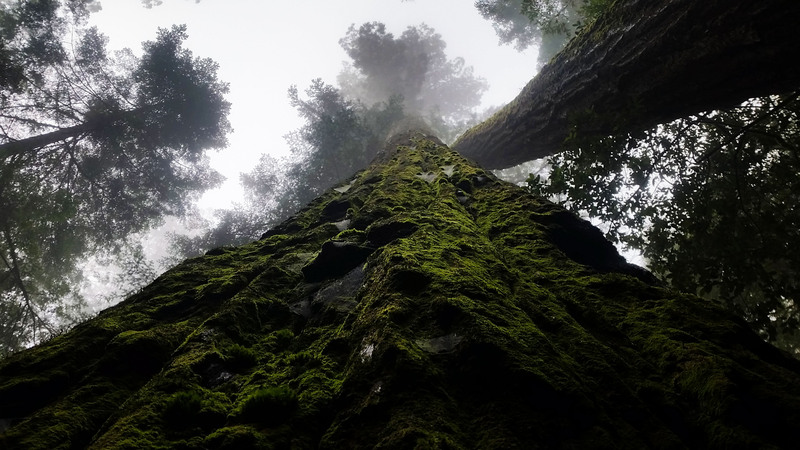 Of course my curiously had gotten the best of me, and I still had to reach the tallest tree which resided on the other side of Redwood Creek. I walked out onto the stone beach to find a raging river. 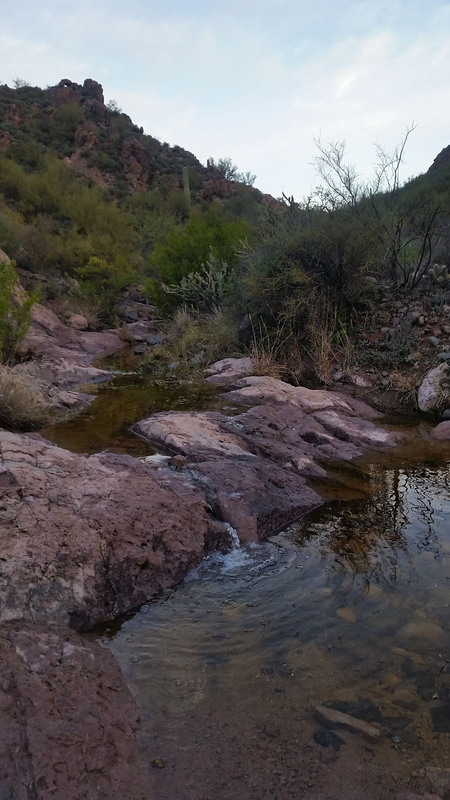 The water was cold and quick, and there was no rock jump or downed tree where I could safely cross. Regrettably I realized this was most definitely a summer hike, so I snapped some pictures and turned back to the trail. The trek out was quite different than the way in. 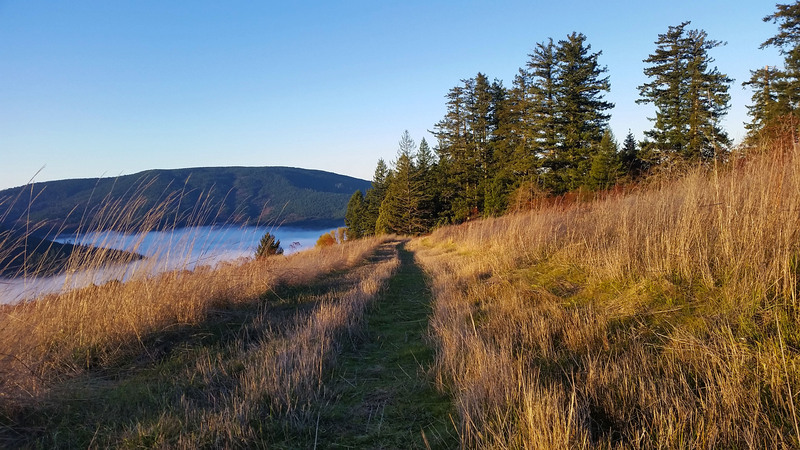 I started running into other hikers taking on the Tall Trees trail, but once I got back onto the Dolason Prairie trail there was no one. The woods were quiet, I had expected by this time of day that they would be more awake with birds, bugs, and other sounds… but there was nothing. I whistled to myself to fill the silence and pushed back up the large hill I had descended that morning. 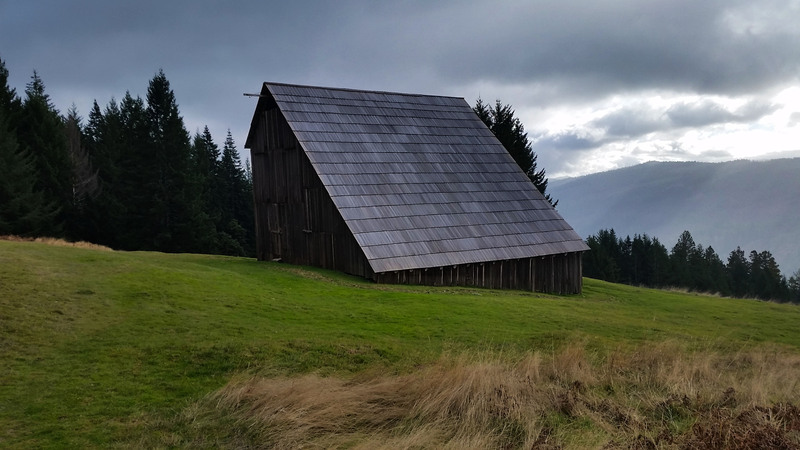 I hiked on through with ease all the way up past the old sheep barn to find cold overcast skies greeting me. I finally reached the van, ready to be fed and get back on the road headed south. 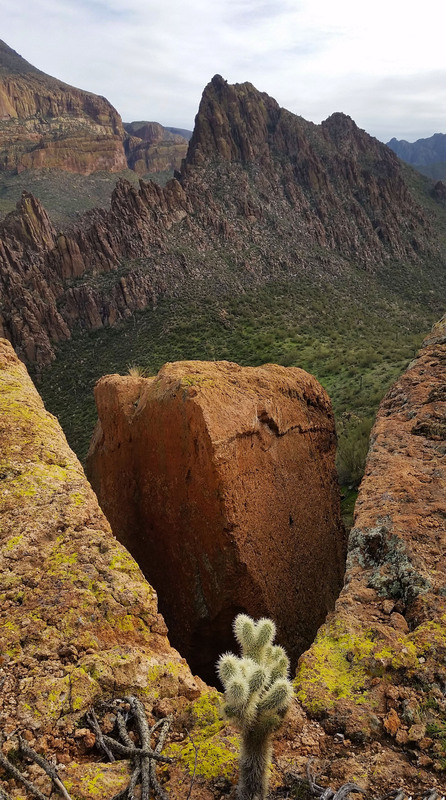 What an incredible day, the hike was like nothing I had ever seen and all it took was a little curiosity to get me there. 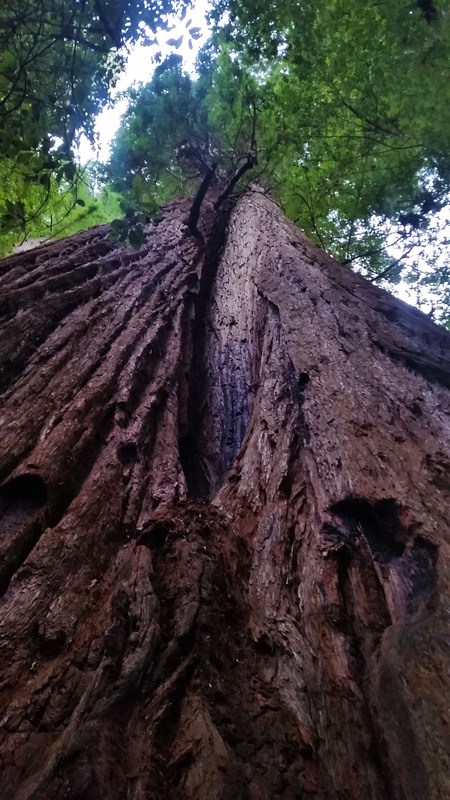 I will definitely be returning to touch the tallest tree… until then redwoods! Moss, mushrooms, fungi, what more could you want?! The wet and humid environment here is a moss's playground!